This lecture class covers everything you need to know to improve your border making skills as you create your own one-of-a -kind quilt. The first class begins with 3 different choices of center star blocks that will be set on point. Then each class will cover 3 different border choices. You will choose one each class as your quilt grows. Many tips on precision piecing will be covered as well as a no-fail technique for perfect mitered borders. 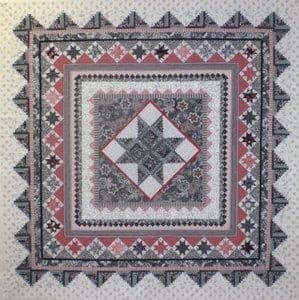 Winnie also has a formula that works every time to make a pieced border fit the quilt.